Manchester (United Kingdom) (AFP) – Arsene Wenger’s long reign at Arsenal is unlikely ever to be repeated, said Manchester City manager Pep Guardiola on Friday. Wenger announced earlier on Friday he would bring the curtain down on his 22 year tenure at the end of the season — a spell that saw the London club achieve the domestic double twice (1998/2002) and the 2003-4 “Invincibles” the first English team in the modern era to go through a First Division/Premier League season unbeaten. Guardiola, who has just led his club to this season’s Premier League title, said that with managers being granted less time to achieve results he doubts anyone would rival the length of time either Wenger or former Manchester United manager Alex Ferguson’s longevity. “All my respect for what he has done. 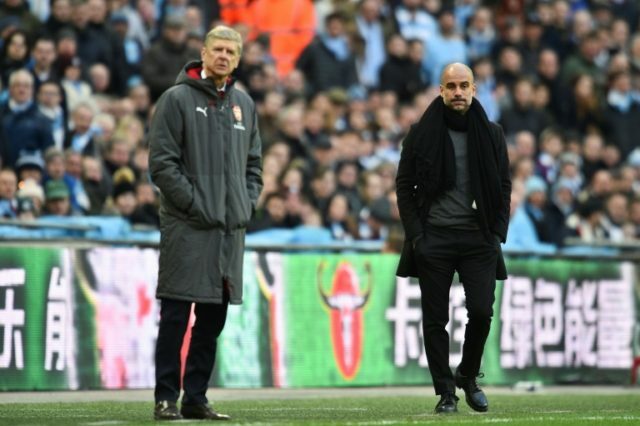 The Premier League is about huge personalities like Arsene,” said Guardiola. Guardiola said he hoped Wenger would not be lost to football.